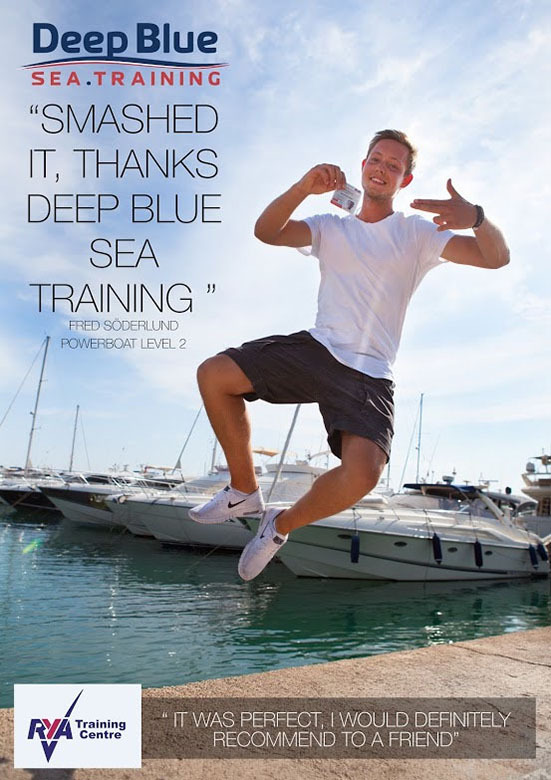 At Deep Blue Sea Training we want you to learn to love sailing as much as we do, so we have a number of ways you can get on board and start sailing. 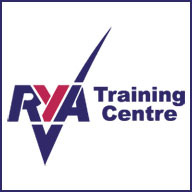 In addition to our sailing experience days, we run a number of RYA courses from sailing for complete beginners through to becoming qualified to be a skipper and take command of your own yacht or a charter boat. We want you to have fun and learn well, so our courses are structured to ensure you get the most from your time aboard. For some excellent sailing around our beautiful island of Mallorca, please see - Learn to sail for fun where you will find information about the various sailing courses that we have on offer including Start Yachting, Competent Crew, Day Skipper Sail, Coastal Skipper Sail Practical Course, Yachtmaster Coastal Sail and Essential Navigation & Seamanship. For those of you that are completely new to yachting, below you will find some information about sailing that you may find useful and informative. 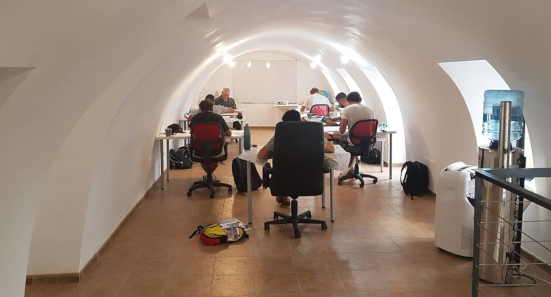 Some of the physics of sailing can be difficult to understand and is best learnt in a practical environment so we highly recommend that you attend our Start Yachting course to fully understand the joys of sailing. Sailing employs the wind, acting on sails, wingsails or kites, to propel a craft on the surface of the water over a chosen course; which is often part of a larger plan of navigation. A course defined with respect to the true wind direction is called a point of sail. Conventional sailing craft cannot derive power from sails on a point of sail that is too close into the wind. On a given point of sail, the sailor adjusts the alignment of each sail with respect to the apparent wind direction to mobilise the power of the wind. The forces transmitted via the sails are resisted by forces from the hull, keel, and rudder of a sailing craft to allow steering the course. In the 21st century, most sailing represents a form of recreation or sport. Recreational sailing or yachting can be divided into racing and cruising. Cruising can include extended offshore and ocean-crossing trips, coastal sailing within sight of land, and daysailing. Until the end of the 19th century, sailing ships were the primary means for marine commerce. Throughout history sailing has been instrumental in the development of civilisation, affording humanity greater mobility than travel over land, whether for trade, transport or warfare, and the capacity for fishing. The earliest representation of a ship under sail appears on a painted disc found in Kuwait dating between 5000 and 5500 BCE. Polynesian oceanfarers traveled vast distances of open ocean in outrigger canoes using navigation methods such as stick charts. Advances in sailing technology from the Middle Ages onward enabled Arab, Chinese, Indian and European explorers to make longer voyages into regions with extreme weather and climatic conditions. There were improvements in sails, masts and rigging; improvements in marine navigation including the cross tree and charts, of both the sea and constellations, allowed more certainty in sea travel. From the 15th century onwards, European ships went further north, stayed longer on the Grand Banks and in the Gulf of St. Lawrence, and eventually began to explore the Pacific Northwest and the Western Arctic. Sailing has contributed to many great explorations in the world. The Egyptians used a bi-pod mast to support a sail that allowed a reed craft to travel upriver with a following wind, as late as 3,500 BCE. Such sails evolved into the square-sail rig that persisted up to the 19th century. Such rigs generally could not sail much closer than 80° to the wind. Fore and aft rigs appear to have evolved in Southeast Asia (dates are uncertain) allowing for rigs that could sail as close as 60–75° off the wind. The physics of sailing arises from a balance of forces between the wind powering the sailing craft as it passes over its sails and the resistance by the sailing craft against being blown off course, which is provided in the water by the keel, rudder, underwater foils and other elements of the underbody of a sailboat. Forces on sails depend on wind speed and direction and the speed and direction of the craft. The direction that the craft is traveling with respect to the "true wind" (the wind direction and speed over the surface) is called the point of sail. 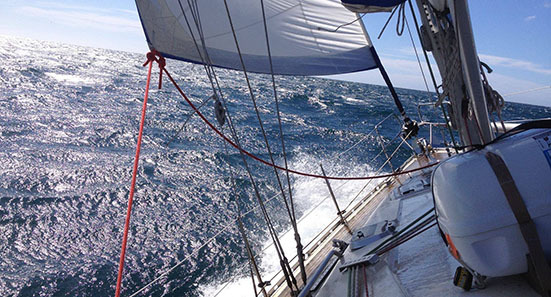 The speed of the craft at a given point of sail contributes to the "apparent wind" — the wind speed and direction as measured on the moving craft. The apparent wind on the sail creates a total aerodynamic force, which may be resolved into drag — the force component in the direction of the apparent wind — and lift — the force component normal (90°) to the apparent wind. Depending on the alignment of the sail with the apparent wind (angle of attack), lift or drag may be the predominant propulsive component. Depending on the angle of attack of a set of sails with respect to the apparent wind, each sail is providing motive force to the sailing craft either from lift - dominant attached flow or drag - dominant separated flow. Additionally, sails may interact with one another to create forces that are different from the sum of the individual contributions each sail, when used alone. The term "velocity" refers both to speed and direction. As applied to wind, apparent wind velocity (VA) is the air velocity acting upon the leading edge of the most forward sail or as experienced by instrumentation or crew on a moving sailing craft. In nautical terminology, wind speeds are normally expressed in knots and wind angles in degrees. All sailing craft reach a constant forward velocity (VB) for a given true wind velocity (VT) and point of sail. 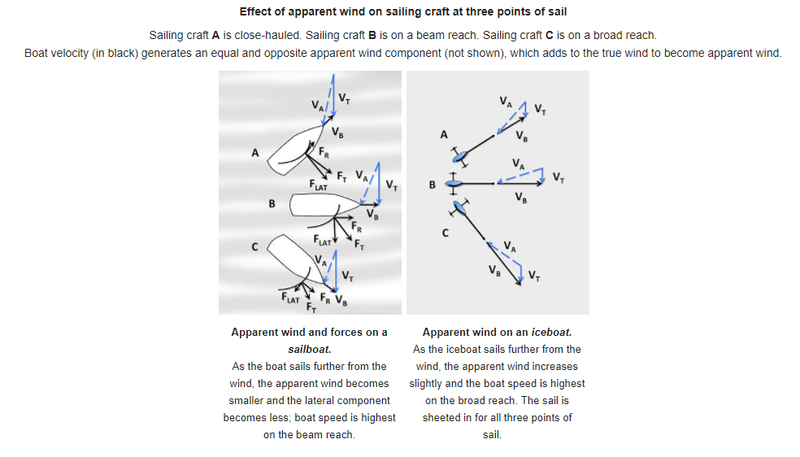 The craft's point of sail affects its velocity for a given true wind velocity. Conventional sailing craft cannot derive power from the wind in a "no-go" zone that is approximately 40° to 50° away from the true wind, depending on the craft. Likewise, the directly downwind speed of all conventional sailing craft is limited to the true wind speed. As a sailboat sails further from the wind, the apparent wind becomes smaller and the lateral component becomes less; boat speed is highest on the beam reach. In order to act like an airfoil, the sail on a sailboat is sheeted further out as the course is further off the wind. Lift and drag are components of the total aerodynamic force on sail, which are resisted by forces in the water. Sails act in two basic modes; under the lift-predominant mode, the sail behaves in a manner analogous to a wing with airflow attached to both surfaces; under the drag-predominant mode, the sail acts in a manner analogous to a parachute with airflow in detached flow, eddying around the sail. Wind shear affects sailing craft in motion by presenting a different wind speed and direction at different heights along the mast. Wind shear occurs because of friction above a water surface slowing the flow of air. The ratio of wind at the surface to wind at a height above the surface varies by a power law with an exponent of 0.11-0.13 over the ocean. This means that a 5-m/s (≈10-knot) wind at 3 m above the water would be approximately 6 m/s (≈12 knots) at 15 m above the water. In hurricane-force winds with 40-m/s (≈78 knots) at the surface the speed at 15 m would be 49 m/s (≈95 knots). This suggests that sails that reach higher above the surface can be subject to stronger wind forces that move the centre of effort on them higher above the surface and increase the heeling moment. Additionally, apparent wind direction moves aft with height above water, which may necessitate a corresponding twist in the shape of the sail to achieve attached flow with height. In points of sail that range from close-hauled to a broad reach, sails act substantially like a wing, with lift predominantly propelling the craft. In points of sail from a broad reach to down wind, sails act substantially like a parachute, with drag predominantly propelling the craft. For a sailboat, point of sail affects lateral force significantly. The higher the boat points to the wind under sail, the stronger the lateral force, which requires resistance from a keel or other underwater foils, including daggerboard, centerboard, skeg and rudder. Lateral force also induces heeling in a sailboat, which requires resistance by weight of ballast from the crew or the boat itself and by the shape of the boat, especially with a catamaran. As the boat points off the wind, lateral force and the forces required to resist it become less important. Wind and currents are important factors to plan on for both offshore and inshore sailing. Predicting the availability, strength and direction of the wind is key to using its power along the desired course. Ocean currents, tides and river currents deflect a sailing vessel from its desired course. Wind – On a global scale, vessels making long voyages must take atmospheric circulation into account, which causes zones of westerlies, easterlies, trade winds and high-pressure zones with light winds, sometimes called horse latitudes, in between. Sailors predict wind direction and strength with knowledge of high and low pressure areas, and the weather fronts that accompany them. Along coastal areas, sailors contend with diurnal changes in wind direction flowing off the shore at night and onto the shore during the day. Local temporary wind shifts are called lifts, when they improve the sailing craft's ability travel along its rhumb line in the direction of the next waypoint. Unfavorable wind shifts are called headers. A sailing craft can sail on a course anywhere outside of its no-go zone. If the next waypoint or destination is within the arc defined by the no-go zone from the craft's current position, then it must perform a series of tacking maneuvers to get there on a dog-legged route, called beating to windward. The progress along that route is called the course made good; the speed between the starting and ending points of the route is called the speed made good and is calculated by the distance between the two points, divided by the travel time. The limiting line to the waypoint that allows the sailing vessel to leave it to leeward is called the layline. Whereas some Bermuda-rigged sailing yachts can sail as close as 30° to the wind, most 20th-Century square riggers are limited to 60° off the wind. Fore-and-aft rigs are designed to operate with the wind on either side, whereas square rigs and kites are designed to have the wind come from one side only. Because the lateral wind forces are highest on a sailing vessel, close-hauled and beating to windward, the resisting water forces around the vessel's keel, centerboard, rudder and other foils is also highest to mitigate leeway—the vessel sliding to leeward of its course. Ice boats and land yachts minimise lateral motion with sidewise resistance from their blades or wheels. A sailing craft can travel directly downwind only at a speed that is less than the wind speed. However, a variety of sailing craft can achieve a higher downwind speed made good by traveling on a series of broad reaches, punctuated by jibes in between. This is true of ice boats and sand yachts. On the water it was explored by sailing vessels, starting in 1975, and now extends to high-performance skiffs, catamarans and foiling sailboats. Jibing or gybing is a sailing maneuver by which a sailing craft turns its stern past the eye of the wind so that the apparent wind changes from one side to the other, allowing progress on the opposite tack. As with tacking, the type of sailing rig dictates the procedures and constraints for jibing. 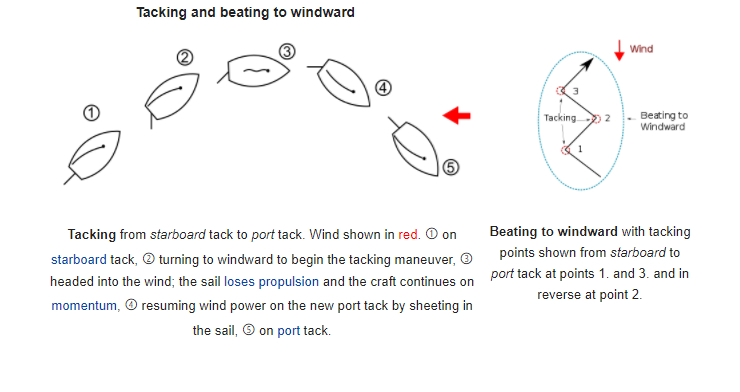 Fore-and-aft sails with booms, gaffs or sprits are unstable when they point into the eye of the wind and must be controlled to avoid a violent change to the other side; square rigs as they present the full area of the sail to the wind from the rear experience little change of operation from one tack to the other; and windsurfers again have flexibly pivoting and fully rotating masts that get flipped from side to side. Fore-and-aft rig – A fore-and-aft sail is set for the wind on one side for a given tack. As the wind changes across the stern and reaches the other side of the sail, the sail may be blown to the other side suddenly unless it is shielded by other sails to windward. If the sail is supported with a boom, gaff or sprit the change may be violent—unless the sheets are tight as the sail is blown to the other side. For a jib, the old leeward sheet is loosened as the stern turns through the wind and the old windward sheet is tightened as the new leeward sheet to allow the sail to draw wind. A jib is usually shielded by the mainsail in this process. The mainsail sheet is tightened to limit the sudden movement from one side to the other and then eased out, once the boat is safely on the opposite tack. On smaller craft, the boom may be controlled by hand. Spinnaker – Some sailboats use a symmetrical spinnaker, a three-sided, parachute-like sail—off the wind. The windward side of a spinnaker is attached to a horizontal pole at the lower corner of the sail and the other end to the mast. The pole is controlled by a line, called a guy, and the other lower corner is controlled by a sheet. When jibing, the pole is disconnected from the mast and attached to the opposite lower corner. Upon establishment on the new tack, the end of the pole that was on the sail is connected to the mast and the former guy becomes the new sheet and vice versa for the former sheet. For high-performance craft with an asymmetrical spinnaker attached to a bow sprit, the sail is jibed in a manner similar to a jib. Windsurfer rig – When sailors of windsurfers jibe, they use one of two techniques, the carve jibe and the duck jibe. The carve jibe allows the sail to pivot away from the as the board is turned with the wind passing over the stern. A duck jibe is initiated on a beam reach and the sailor presses the sail towards the wind and passes the back end of the boom over to the other side, "ducking" under it. The most basic control of the sail consists of setting its angle relative to the wind. The control line that accomplishes this is called a "sheet." If the sheet is too loose the sail will flap in the wind, an occurrence that is called "luffing." Optimum sail angle can be approximated by pulling the sheet in just so far as to make the luffing stop, or by using of tell-tales – small ribbons or yarn attached each side of the sail that both stream horizontally to indicate a properly trimmed sail. Finer controls adjust the overall shape of the sail. An old saying goes, “Once you’ve realised it’s time to reef, it’s too late.” A similar one says, "The time to reef is when you first think about it." Hull trim is the adjustment of a boat's loading so as to change its fore-and-aft attitude in the water. In small boats, it is done by positioning the crew. In larger boats, the weight of a person has less effect on the hull trim, but it can be adjusted by shifting gear, fuel, water, or supplies. Different hull trim efforts are required for different kinds of boats and different conditions. Here are just a few examples: In a lightweight racing dinghy like a Thistle, the hull should be kept level, on its designed water line for best performance in all conditions. In many small boats, weight too far aft can cause drag by submerging the transom, especially in light to moderate winds. Weight too far forward can cause the bow to dig into the waves. In heavy winds, a boat with its bow too low may capsise by pitching forward over its bow (pitch-pole) or dive under the waves (submarine). On a run in heavy winds, the forces on the sails tend to drive a boat's bow down, so the crew weight is moved far aft.